M@ The Most Eccentric Book About London Ever? "It is regretted that many of the author's original photographs, including those of some items no longer existing, went missing, presumed stolen, during a bomb alert in London." Those are the opening words of London: 101 Oddities, the most idiosyncratic guide to London we've ever encountered. 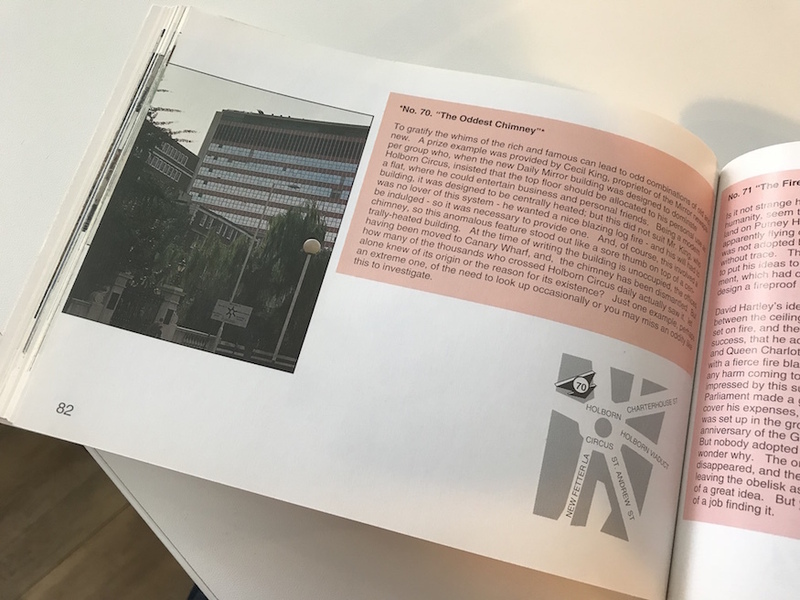 The book, published in 1994, follows the now over-familiar format of uncovering 'hidden gems' and 'little-known secrets' that regular guidebooks ignore. But this one's different. Its author, J Edward Hart, was in his tenth decade at the time of writing. His book reflects a long life of exploring London, photographing and lecturing on its oddities. And what treasures he uncovers. The two-way pillar box of Chelsea; a stained-glass window featuring golf clubs; a rail bridge built in two days; and London's narrowest alley (which modern day quirkologist IanVisits recently revived) are just four examples. Many, sadly, have vanished. The Wood Street Compter once dispensed wine in subterranean prison cells. The 1950s Daily Mirror office block on Holborn Circus (below) is mourned by few, but who knew it had an old-style chimney on the roof to indulge the hearthside whims of the paper's proprietor? Soho is missing its shop for left-handed people. Brixton is now denuded of its six-faced clock, while Mayfair has lost its 'highwayman's get-away'. Hart discusses his oddities with affection, and his character shines through in the text. You have to salute an author who encloses a copy of his own coat of arms, and places the letters BSc., FSMC (Fellow of the Worshipful Company of Spectacle Makers) after his name. The book was clearly compiled on a shoestring, with haphazard layouts, a strikingly old-fashioned (for the 1990s) cover, and no evidence of a copyeditor's attention. Indeed, an insert provides a sad note, apologising for the typographical errors, as the edition was printed 'in haste on the hospitalisation of the 92-years-old author'. All of this adds to the eccentricity of the book, and seems somehow appropriate for a catalogue of oddities. 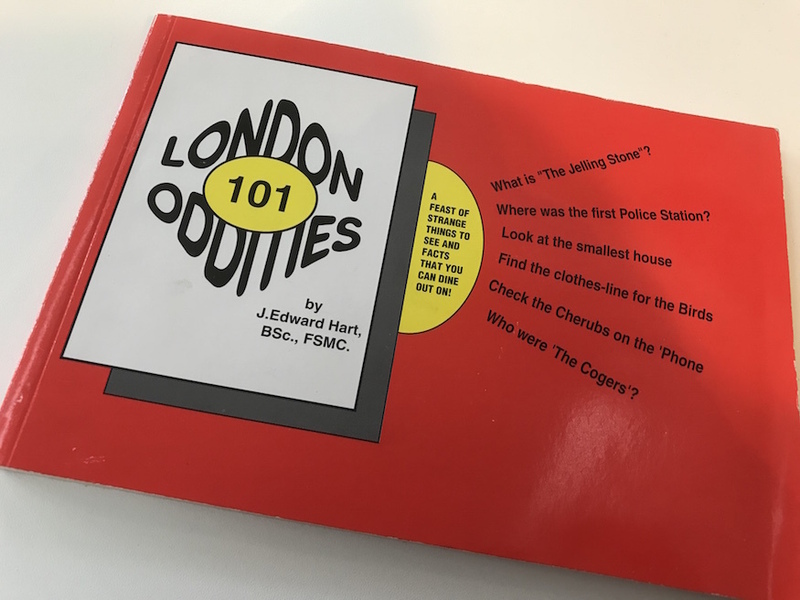 London: 101 Oddities is long out of print, but second-hand copies are readily found online. We'd encourage anyone with a passion for exploring London to seek it out. Finally, if any of Edward Hart's friends or family chance across this article, we'd like to pass on our respects for the man and his work. We hope the missing photographs, stolen in that bomb alert, found their way back home. "Farewell dear reader, and good luck with your explorations."